Flow Water Solutions will service, repair and update. At Flow Water Solutions we service what we sell plus, we service and repair other manufacturer’s water treatment equipment. 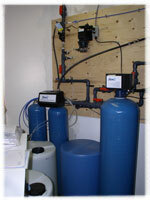 These include Softeners, Automatic Filters, Ultra Violet Systems, and Reverse Osmosis Systems. Flow Water Solutions will service, repair, update and or replace all aspects of water treatment equipment. We service residential, commercial and industrial accounts so we’re confident your Flow Water Solutions experience will be fantastic. We’re incorporated with over 40 years of combined service and experience in the water industry so you know you’re in good hands. Flow Water Solutions has service and installation technicians that are M.O.E. licensed. Flow Water Solutions is a member in good standing of the ‘Ontario Ground Water Association’. Our service speaks for itself at Flow Water Solutions. “Our honesty and high regard for each and every one of our customers personal concerns and water related issues, comes in as our Top Priority”. (in accordance with our labour rates). Flow Water Solutions is never far away because we’re committed to solving all your water problems. Contact us today.